Dale Housh has been manager at the Promise City location since 1981. At that time, there were 3 employees and one location. 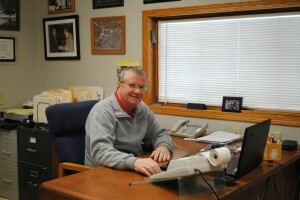 Dale became part owner when the Unionville store was purchased in 1988 and became full owner in 2006, shortly before he acquired the Chariton location. Dale prides himself on customer service and thinks his current staff of over 65 employees deserves most of the credit for Lockridge’s success today. Lockridge is a family operation which includes his wife, 2 sons, his only daughter and her husband, nieces, a nephew, and in-laws. Dale is a member of the Iowa Home Builders, is a director of the Northwestern Lumber Association and is involved in several local organizations and committees. Lockridge, Inc. is also a big supporter of the area 4-H groups and youth sporting events.